Since 1 April 1996, Wales has been divided into 22 single-tier principal areas for local government purposes. The elected councils of these areas are responsible for the provision of all local government services, including education, social work, environmental protection, and most highways. Below these there are also (in most, but not all, parts of the principal areas) elected community councils to which responsibility for specific aspects of the application of local policy may be devolved. The queen appoints a Lord Lieutenant to represent her in each of the eight preserved counties of Wales, which are combinations of principal areas retained for ceremonial purposes. Subdivisions of Wales created for such purposes as the organization of the National Health Service and the provision of police and emergency services are made up of combinations of principal areas. For example, the Dyfed–Powys Police force operates in the area covered by the principal areas of Pembrokeshire, Ceredigion, and Carmarthenshire – the former three constituting the preserved county of Dyfed. There are six cities in total in Wales: in addition to the three principal areas with city status (Cardiff, Swansea and Newport), the communities of Bangor, St Davids and St Asaph also have the status. City status is granted by letters patent. St Asaph, as the seat of a bishopric, was historically referred to as a city, and was described as such in the 1911 Encyclopædia Britannica. The status was, however, not officially recognised for many years. When city status was restored to St Davids in 1994, St Asaph town council submitted a petition for the same purpose. The petition was refused as, unlike St Davids, there was no evidence of any charter or letters patent in the past conferring the status. Applications for city status in competitions in 2000 and 2002 were unsuccessful. However, city status was finally granted to St Asaph in 2012 as part of the Queen's Diamond Jubilee celebrations: St Asaph was selected "to recognise its wealth of history, its cultural contribution and its metropolitan status as a centre for technology, commerce and business." There are 22 principal areas in Wales. They came into being on 1 April 1996 by virtue of the Local Government (Wales) Act 1994 (1994 c. 19). 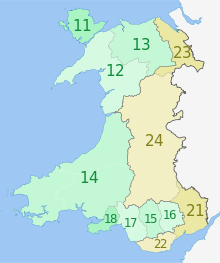 Eleven are named as counties, including the Cities and Counties of Cardiff and Swansea (marked *), and eleven are styled as county boroughs (marked †). In 2002 Newport was granted city status, and the county borough is now styled as the "City of Newport". Welsh language forms are given in parentheses, except where there is no English equivalent. Locations of each council headquarters are indicated by yellow markers. Areas are Counties, unless marked * (for Cities) or † (for County Boroughs). Welsh-language forms are given in parentheses, where they differ from the English. Like councils throughout the UK, Welsh councils are made up of elected councillors. Exceptionally, because of political in-fighting and a history of poor performance, the executive functions of the Isle of Anglesey Council were temporarily taken over by commissioners appointed by the Welsh Government. Elections planned for 2012 were delayed until 2013. For ceremonial purposes of Lieutenancy and Shrievalty, Wales is divided into 8 preserved counties which are based on the counties created by the Local Government Act 1972 and used for local government and other purposes between 1974 and their abolition in 1996. The historic counties of Wales are ancient subdivisions of Wales, used for various functions for several hundred years. Wales had no official counties until the 13th century. In the south east, Norman advancement led to the creation of marcher lordships, such as Glamorgan, which served as semi-autonomous administrative divisions, although these were not counties in the true sense as they lacked the formal structure. Some towns within these areas did, however, receive charters which outlined rights and duties in much the same way as a borough. Counties in the strict sense first appeared with the establishment of Cardiganshire and Carmarthenshire in the 1240s. In 1284 the Principality of Gwynedd was divided into three counties: Anglesey, Caernarvonshire and Merionethshire. This can be regarded as an arrangement imposed on Wales by the English during the last years of Prince Llywelyn II. Before the end of the century, Flintshire had also become a county, and thus nearly half the territory of Wales was under the rule of the English Crown. While the arrangement did not officially bring the marcher lordships in the South directly under the King's control, many such lordships were held by the King personally, although some remained under the semi-autonomous control of powerful local families. The formation of counties was completed under the Act of Union 1536, which created Pembrokeshire, Montgomeryshire, Denbighshire, Radnorshire, Glamorganshire, Brecknockshire and Monmouthshire, many from existing marcher lordships now recreated as counties proper. These 13 counties were the main administrative subdivisions of Wales from 1536 until the implementation in 1974 of the Local Government Act 1972, although the definition and role of the smaller county boroughs within the counties during that period saw considerable change, as it did across the United Kingdom. At the lowest level of administrative subdivision in Wales are the communities, into which each principal area is subdivided. They may have elected community councils which perform a number of roles, such as providing local facilities, and representing their communities to larger local government bodies. Community councils are the equivalent of English parish councils. A community council may call itself a "town council" if it so wishes. The councils of three communities with city status – Bangor, St Asaph, and St Davids – are known as "city councils". Communities which are too small to have a council may have a community meeting instead: an example of direct democracy. The communities in the urban areas of the cities of Cardiff, Swansea and Newport do not have community councils. In April 2013, it was announced that a major review was to be undertaken into local government organisation in Wales, with a Commission on Public Service Governance and Delivery being established, to be chaired by Sir Paul Williams. First Minister Carwyn Jones said: "Since public sector budgets are likely to continue to tighten, and demand pressures grow, there is a clear need to examine how services can be sustained and standards of performance raised, so that people in Wales can continue to receive and influence the public services they need and value." The Commission reported on 20 January 2014. It recommended that the number of councils be reduced, through mergers rather than through boundary changes, from 22 to 10, 11 or 12; and suggested that the cost of merging the councils would be met through savings made within about two years. Wales' First Minister Carwyn Jones said: "This report addresses many issues that are critical at a time when the need for public services is outstripping the resources available to provide them. I have always been clear that the status quo is not an option. Change is inevitable and essential so that our public services can become more efficient, effective, accessible and responsive." Janet Finch-Saunders AM, shadow minister for local government, said: "What matters to the vast majority of hardworking families is not the intricate structures of local government, but knowing that services will be delivered in an efficient and cost effective way.... We believe that public services are best delivered locally so taxpayers can hold local representatives to account for what happens in their community." Rhodri Glyn Thomas, for Plaid Cymru, commented: "The weight of evidence presented to the Williams Commission shows that if the people of Wales are going to get the services they need and deserve then there has to be a radical improvement in the way public services are delivered." In response to recommendations made by the Williams Commission, the Welsh Government published a draft local government bill in November 2015. The draft bill contained two proposals, one for eight local authorities and one for nine local authorities. The only difference between the two proposals related to North Wales. The bill did not propose names for the local authorities, only listing them by number as a combination of existing principal areas. Powys was not affected by either proposal. The changes were planned to take effect in April 2020. ^ Beckett, J V (2005). City Status in the British isles, 1830 – 2002. Aldershot: Ashgate Publishing. pp. 133–135. ISBN 0-7546-5067-7. ^ "Three towns win city status for Diamond Jubilee". BBC NEWS. 2012-04-18. Archived from the original on 2012-04-25. Retrieved 2012-04-18. ^ "Local Government (Wales) Act 1994". www.legislation.gov.uk. Archived from the original on 14 September 2017. Retrieved 8 May 2018. ^ "Newport City Council". Newport City Council. 4 December 2010. Archived from the original on 9 December 2010. Retrieved 5 March 2011. ^ "The Residuary Body for Wales (Levies) Regulations 1996". www.opsi.gov.uk. Archived from the original on 9 December 2009. Retrieved 8 May 2018. ^ "Island council takeover to begin". 17 March 2011. Archived from the original on 25 April 2012. Retrieved 8 May 2018 – via www.bbc.co.uk. ^ "Anglesey poll postponed for year". 8 May 2018. Archived from the original on 13 May 2017. Retrieved 8 May 2018 – via www.bbc.co.uk. ^ "Community councils". Cardiff Council. Archived from the original on 6 September 2018. Retrieved 7 April 2017. ^ "Community/Town Council contact details". City and County of Swansea. Archived from the original on 8 April 2017. Retrieved 7 April 2017. ^ "Community council contact details". Newport City Council. Archived from the original on 8 April 2017. Retrieved 7 April 2017. ^ Local councils in Wales could be cut after review Archived 2013-04-19 at the Wayback Machine, BBC News, 19 April 2013. ^ a b Williams Commission report calls for fewer councils Archived 2014-01-22 at the Wayback Machine, BBC News, 20 January 2014. ^ "Consultations - beta.gov.wales". beta.gov.wales. Archived from the original on 30 May 2016. Retrieved 8 May 2018. ^ a b "Welsh Government - Local Government Reform White Paper unveiled by Mark Drakeford". gov.wales. 31 January 2017. Archived from the original on 17 October 2017. Retrieved 8 May 2018.